Earlier this month I was at the JP Centre/South Main Streets Valentine's Day Pop Up shop, where I was selling my jewelry. I was again surprised by how many people are surprised to know that I make all of my handmade metal jewelry. I do not purchase components and attach them, and finished product was not made in a third world country and shipped to me. I realize, however, prior to eight years ago, I would not have believed I really made everything myself, either. 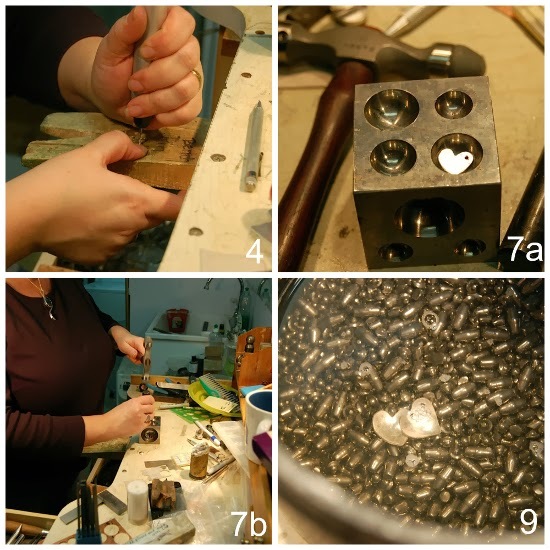 As such, I have decided to share a bit of the process in making heart-shaped earrings for the holiday. 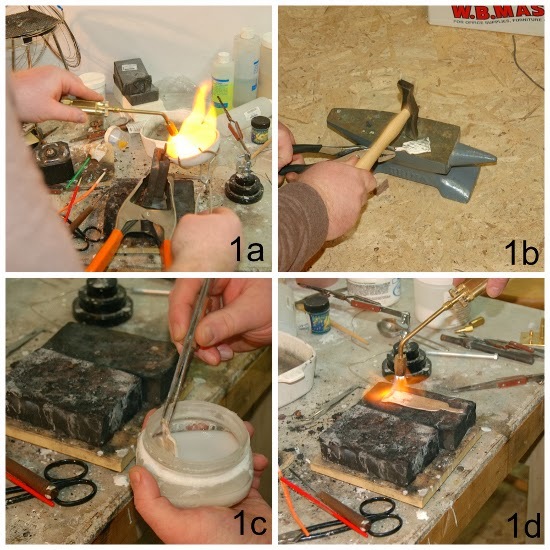 In my studio, we have the capability of casting our own sterling silver ingots, forging, anneal, and then rolling the ingot through our rolling mill to the desired thickness. For earrings, I typically use 20-gauge thickness, or thinner. Earlobes can be fragile, and rip from earrings that are too heavy. By keeping my metal thin, my earrings can be larger. Hearts are fairly easy to draw. I take a scribe, and draw a heart on the metal to the desired shape. If I’m uncertain, I can start with a black sharpie. I pierce the shape with a well-waxed jeweler’s saw. I file the edges of the heart, to smooth out any wobbles or sharp edges caused by the saw. Once the shape is perfect, I trace the heart with my scribe on the metal, so that the second earring will match the first. If I prefer the earrings not to match, I can just scribe the second heart. I pierce the second heart, and file the sharp edges. I drill a hole with my flex shaft in the earrings where I want my ear hooks to attach later. For this design, I am going to give the earrings a slight dome. Even the slightest dome makes the earrings stronger, and less likely to face damage. Presently, it is likely the metal is work hardened. To dome it in it’s present state, I run the risk of cracking the metal. I will need to anneal the earrings with my torch. I light my torch and heat up the earrings with a small circular motion so that the heat doesn’t get directed to one spot and melt the silver. I quench the metal in cold water, and place in a pickle bath. Once out of the pickle, I stamp the back of the earrings with a .925 stamp and my maker’s mark; my way of showing that the piece is sterling silver and made by me. 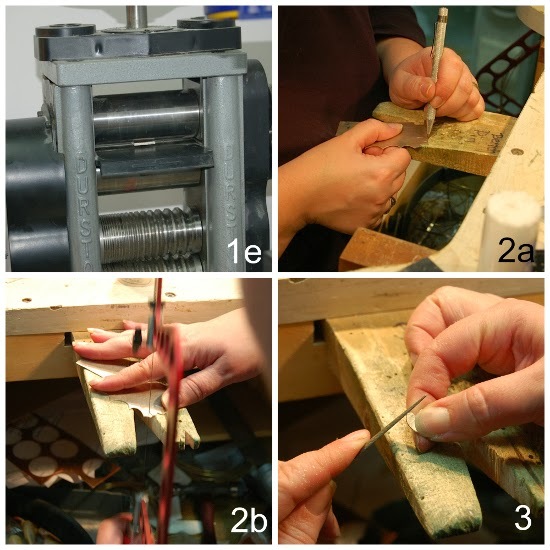 additional annealing can be required. The earrings and ear wires are placed in a tumbler with water, soap, and steal shot for a few hours. When it comes out, it is work hardened, and unlikely to bend. The earrings are attached to the ear wires, polished, and ready to go! There you have it! I’m ready to wear heart earrings on my date tonight with that special someone. *Disclaimer: These directions are not written with a true beginner in mind. I do not recommend attempting this project, unless you have knowledge of proper torch use, and some direction in using a jeweler’s saw. Furthermore, sterling silver is available in sheet and wire, without making it myself; however, there is no better way to have a great variety of sizes in stock, once one starts working in any quantity.